After the week-long build-up of car preparation, pace-note making and service schedule planning its was dawn on Saturday morning and it was time to go rallying. The hotel was full of movement at an unaccustomed early hour as drivers, co-drivers and service crews bustled about packing the last minute items into the vans and rally cars and then one-by-one the rally-cars were started up and driven down to the start breaking the tranquility of a lovely Caribbean morning - and probably annoying other guests no end! At the Simpsons Motors Service Park there was the usual melee of rally cars trying to find a good parking place, service teams trying to set up their spot, journalists wandering about shoving cameras into the face of anyone who was dressed in a racing suit and masses of the local enthusiasts who had turned out in droves to see the start of Rally Barbados 2004. The two Middlesex team, Tom & Rob in their Proton and Graham & Tony in their Porsche, had joined the McEnearney Motors team for the duration of the rally and so were able to take advantage service facilities and parking area which they had commandeered for the team. At a few minutes to 9.00 am they first car rolled towards to start ramp ready to drive off on the stroke of the hour only to come across a rather embarrassing problem. The organisres had built a brand-new all-steel starting ramp for the Rally but had not reckoned with the fact that most rally-cars had front 'spoilers' and air-dams etc which reduced the ground clearance at the front of the cars. The ramp was therefore too steep for the cars to get up without damaging the front bodywork. The ramp now occupied the space on the startline and it was impossible to drive past it so there was a short delay while the ramp was dis-assembled and moved out of the way. Once this little hitch had been resolved, the Rally got off to a good start with several thousand spectators cheering each car as it crossed the Startline to the sound of commentary from Robin Bradford, whose inexhaustible store of knowledge and stories about each of the drivers kept the proceedings entertaining. Graham and Tony went off at their allocated start number of 72 and Tom and Rob follwed shortly after at number 90. 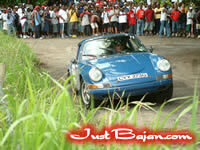 By the time we get to the start usually most of the spectators have gone off to get into place to watch the stages but this time there was still a good crowd as we pulled out of the Start to drive up to the first of the planned 32 Special Stages of Rally Barbados 2004. As I have aleady mentioned the weather had been rather wet in the days leading up to the Rally and there had been a very heavy downpour during the night prior to the start but, amazingly, from the moment that the rally started until now (Tuesday evening) there has not been another drop of rain. This meant that all the stages were dry and fast and obviously encouraged plenty of brave and sometimes reckless driving. By the time we got into Stage 1 there were already at least six cars in ditches, off the road or broken down at the road-side. The attrition rate was pretty high and it soon became clear that there were going to be many less finishers than starters. After my crash on last year's event I was determined to get the car to the finish in good shape and if we could do well in our class that would be a bonus. Accordingly I drove well within the capability of both the car and the driver and we stayed pretty-much out of trouble. WE were having a Class battle with the only other standard Proton in the Rally, that of Martin Taylor and Peter Gallagher from Ireland. We had beaten them by 9/100th of a second in the Super Sprint last weekend at Bushey Park so he had something to prove. However, their Proton was fitted with Limited Slip Differential and a 'Dog-Box' gearbox which gave them a slight technical advantage and this translated into slightly faster stage times. The format of the Rally was based on loops of three stages followed by a visit to the Service Park to check the cars, refule if necessary, give the crew a short break and then set off for the next loop. The first interim results were available after the first three loops and they showed that already the number of cars still running in the rally was down to 65 from the original 94 starters. There were actually more cars still running on the stages since, if you had a crash or a mechanical problem, it was possible to rejoin the event after you had fixed the car but now you could not be classified as a finisher and your times would only count towards class places if you managed to complete 75% of all stages. To be classified as a finisher a car had to complete all stages within the time allowance and not be more than a total of 30 minutes late at any control point in the rally. At the end of 9 stages Graham and Tony had moved up from 72 to 43 overall and third in the Historic Class while Tom and Rob were in 54th place and 2nd in the Production 2 Class, 5 places and 1 min 26 seconds behind the other Proton. Now it was time to fit the spot-lights and set off for two laps of the stages in the dark - something which is quite rare in rallying these days. Not many events incorporate night rallying and so the opportunities to practice a few. There were consequently quite a few more retirements and accidents on the last two loops of the day. By the time the cars finished the first day at around 10.30 pm there were only 52 cars still in the overall standings and in line to be classified as a finisher. Graham and Tony had moved up to 38th overall and still 3rd in Class while Tom and Rob were now 48th overall and 2nd in Class. The first thing to do after the last stage for the day had been completed was to get the car cleaned and checked over to ensure it was in good shape for the second day of rallying which would start in only a few hours at 7.00 am on Sunday. By the time the crews got back to the hotel, showered and got to bed there was only time for 5 or 6 hours sleep before the alarm went off and it was time to make our way to the Six-Roads Restart and Service Park which would be the base for the Sunday leg of the rally. 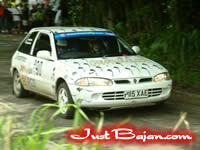 The weather continued to be perfect and the days stages were dry, fast and flowing. The crowds were out in great numbers - rather too many as it was later to prove. The fall-out rate of competitors was much less than the first day and the rally settled down to its regular routine as the comptitors completed three more loops of three stages before the lunch break. The first loop after lunch started normally and we completed the first stage but on arrival at the second stage it became apparent that there was a problem - almost the whole rally entry was held up at this point. It turned out that a very large number of spectators had collected along the route of the stage and had been enjoying rather too much of the famous Caribbean rum and sun. Some trouble broke out between the spectators and the police were sent in to sort it out. It all got out of hand and we heard rumours of an attack on a policeman and even stories of shooting! The organisers wisely cancelled the stage and the remaining loop of three stages and directed all competitors to proceed directly to the Vaucluse Rally Sprint Track which was to be the final part of the rally. Once all cars had arrived there, they were paired off and raced against each other for the amusement of the vast crowd which had assembled here. The race did not actually count towards the results of the rally but it was a fun way to finish the Rally. A large patch of standing water on a critical bend on the track made the event rather a lottery but it was enjoyed by all. There was fierce competition to be among the early runners so that you could be declared a finisher and start partying. The first Banks Beer tasted so good after several alcohol-free days before the rally and was the first of many consumed that night as we celebrated our first finish in Rally Barbados and a 2nd in Class trophy to collect at the prize-giving next day. 1st Overall Roger Skeete and Dave Crawford - the top team from McEnearney Motors - so we felt that we had been part of the winning team. It was a memorable and enjoyable event. The hospitality and friendship shown to all overseas competitors by the locals is a major factor in making it so and almost the first thing they ask you after 'Good Day' is 'Are you coming again next year?'. All I can say is that there will need to be some very important reason to keep me away from Barbados this time next year!..